Bangalore: CMR institute of Technology held its Inauguration function of Academic Programmes 2018 at the college premises. The orientation programme was held to enlighten students and parents about the course structure, examination details and most importantly their responsibilities. Dr Sanjay Jain, Principal CMRIT, welcomed the gathering and briefed about the achievements of institution. 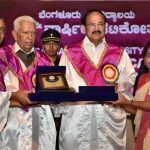 Speaking of the occasion, Dr Karisiddappa, Dr. Karisiddappa, Honourable Vice Chancellor, Visvesvaraya Technological University, Belagavi said, “Innovations in engineering are essential to find solutions to problems in society. In the era of interdisciplinary learning, budding engineers need to develop interest towards all branches of engineering in order to inculcate the skill of Innovations. Innovations from Engineers have potential to transform the society.” He elaborated on the initiatives being taken to encourage the talented students to take their innovative ideas from labs to market. VTU is proactively funding innovative projects aimed at rural technology, IT sector and engineering. He observed that practical training through internships plays a major role in providing industry exposure to the students. Dr M S Shivakumar, Vice Chancellor, CMR University who was present on the occasion mentioned that every branch of engineering has potential to provide solutions to real life problems. Learn to manage your life while facing several challenges, he said. He stressed the need life skills for engineers. He observed that excellence can be achieved with talent and right attitude. Budding engineers need to inculcate passion for learning, creative thinking and continuously update knowledge. Stressing the need for large scale Industry- Institution Interaction, he encouraged budding engineers to concentrate on soft skills. He felicitated academic toppers and innovators. Sri KC Jagannathreddy, Secretary, CMRJT presiding over the function elaborated on the efforts made by the management to provide best facilities to enable students to acquire practical knowledge. Principal Dr Sanjay Jain interacted with parents and students on current scenario in the industry, challenges and placement opportunities. He stressed that students must take up research and elaborated on the research facilities provided in the college. Many parents and students who were present felt happy over learning about their responsibilities and future prospects.